Peter Hickman’s father Dave won the Manx GP Lightweight in 1977 and raced in the TT twice. At the age of one Peter was taken to his first TT, strangely not returning until 2013. His first racing appearance at the TT came the following year. Hickman’s racing career started on the track however, where he won the National Superstock 1000 Cup Championship in 2004. This led to him making his British Superbike Championship debut in 2006, where he finished 18th. Taking road racing by storm and constantly surprising the riding world has to be up there with Hickman’s achievements. None more so than winning the 2015 Macau GP, whereby he beat household names such as John McGuinness, Michael Rutter and Martin Jessopp, as essentially a newcomer, having been forced to withdraw the previous year after the opening qualifying sessions. Going on to retain his title in 2016 must also be up there with Hickman’s finest moments. The year previous was also a very successful for Hickman which saw him set the fastest ever newcomer laps at the Isle of Man TT, Ulster Grand Prix and North West 200. Having taken his first win at the event in 2015, the 2017 Ulster Grand Prix was somewhat dominated by Hickman, winning the Dundrod 150 Superbike race and then going on to win the Superstock race and both Supersport encounters on the feature race day. This was also the year he fulfilled the potential shown in previous years at the Isle of Man TT with a superb five podiums from his five races. Hickman should also be praised for his consistency in BSB 2017, only failing to finish one race out of 26, which came at a very wet Silverstone which saw only seven riders cross the finish line. With first and second at Thruxton, Peter finished in fourth overall to confirm his tag as the best all-rounder currently competing in the UK. 2018 proved to be a historic and remarkable year for Hickman, where he was victorious at all four of the international events he competed in. The year started well for Hickman, taking a win in the Bayview Hotel Superstock race at the North West 200, with a best lap time of 4:24.066 at an average speed of 122.288mph. Racing for Smith’s Racing BMW, Hickman beat Alastair Seeley over the line by just over half a second to get his impressive road racing campaign underway. The roles were reversed in the North West 200 CP Hire Superstock race however, with Seeley pipping Hickman to the post, meaning Peter was on the podium again, this time as runner-up. During practice week at the Isle of Man Hickman showed great pace, with many tipping him to win a TT although race week got off to a disappointing start for Peter, having to retire early in the Superbike encounter. 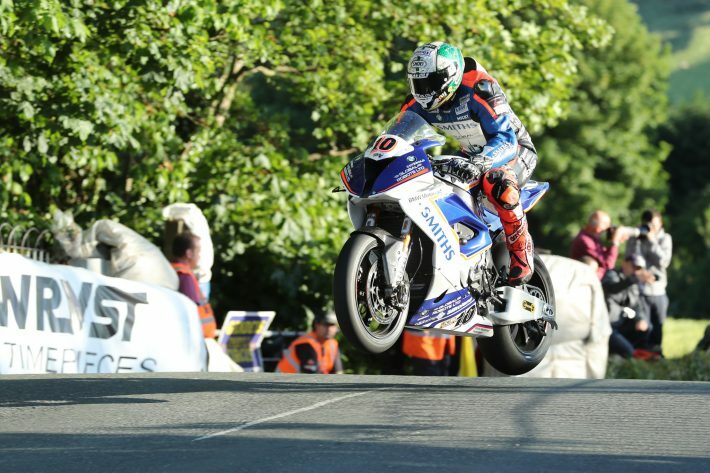 This was put right in the Superstock race however, where Hickman rode the 2018 BMW S1000RR to 1st place, despite being 20 seconds down at Glen Helen after having to loop around the tree before getting back on track at Braddan Bridge. 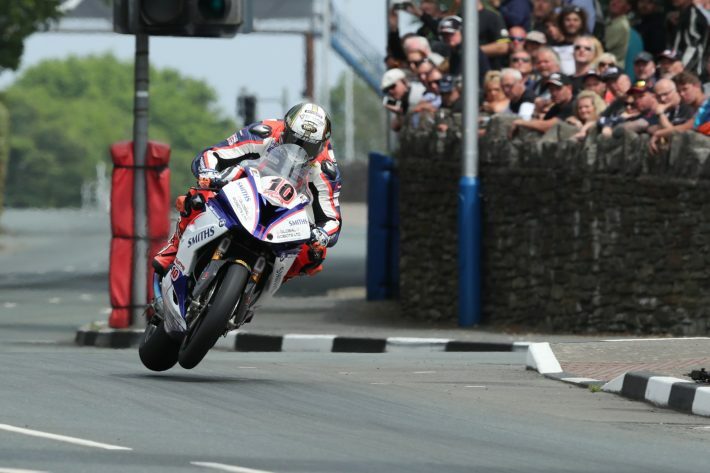 As well as picking up a TT win, Hickman also smashed the Superstock lap record with a fastest lap of 134.403mph. Hickman played a huge part in what was one of the best Senior TT races of all time, where he beat Dean Harrison over the line by just over 2 seconds in a race that was heavily contested throughout. Yet again, Peter did not just take the win, he ripped up the history book, and his remarkable 135.452mph lap saw him become the first rider to lap the Mountain Course at over 135mph, this now meaning that of the six sector records, Hickman holds three of them. Hickman also found himself on the podium at the TT in the Supersport 1 and Supersport 2 races, where he came 3rd and 2nd respectively, riding the 2015 Triumph Daytona 675. Hickman’s dominance on the roads did not stop there, with Supersport and Superbike wins at the Ulster Grand Prix, as well as finishing the year with his third Macau GP win in four years. As well as being one of the most famous faces on the road racing scene, Hickman also competed in the British Superbike Championship for Smiths Racing BMW. Hickman came 5th on 577 points, just 7 points off Josh Brookes in 4th and 11 points behind Glen Irwin who came 3rd. He was again on the podium at Thruxton with another being taken at Assen. What do you aspire to if you’ve achieved great things in nearly all races possible? More of the same! Having won races at all of the International meetings in 2018, repeating this will be a top target for Hickman in 2019 whilst he’ll again be looking to secure a ‘Showdown’ position in the British Superbike Championship as he has done in the previous two season.